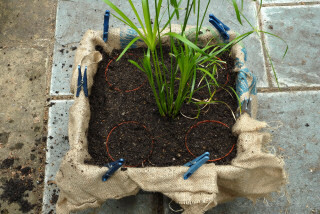 Although the science of planting a pond plant basket is fairly straightforward, a lack of planning can lead to a haphazard result. Plants generally end up unevenly spaced in all dimensions. 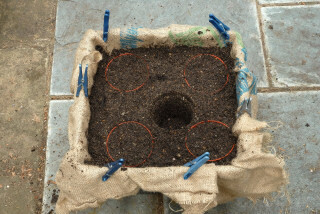 Adapting the idea from - Re-potting - allows for a wrinkle free operation. 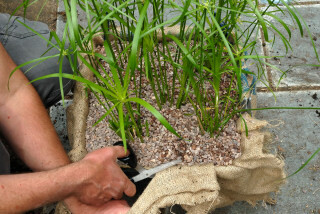 The recommended planting medium for aquatic baskets has gone through a number of changes over the years. Originally there was the 'Aquatic compost, specially formulated for pond plants' The typical result of using this product was to turn your pond a nice mud colour for a few days. Next it was deemed that 'garden soil' was preferable. Now the recommended practice is to use gravel. Gravel is definitely superior than the two previously mentioned products. It does not cloud the water,is heavy and does not require the use of a basket liner. 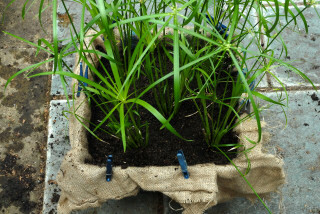 The plants roots are able to escape out of the basket easily and gorge on pond sediment. 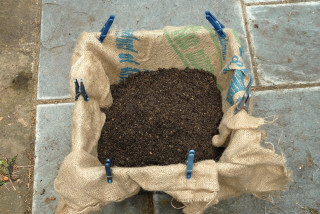 50:50 mixture of Peat : Grit sand. 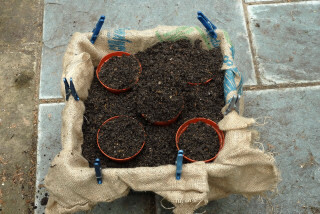 A peat/grit sand mixture makes the process of planting a pond plant basket by the following method much easier than gravel. 1. 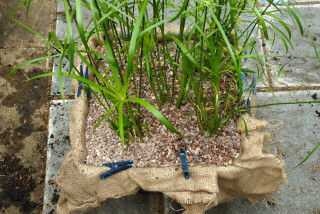 The first step is to line your pond plant basket with Hessian sacking. Add an amount of the peat/sand mixture to settle the Hessian in place and secure the Hessian with clothes pegs. 2. 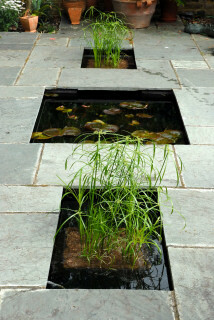 Place empty flower pots that correspond to the size of pots your aquatic plants are currently residing in. 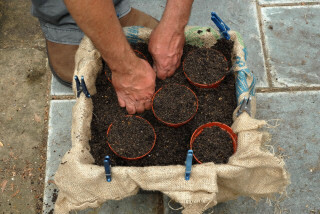 Firm them in so that the top of the flower pots are about in inch (2-3 cms) below the rim of the pond planting basket. 3. Add some more of the mix. 4. Firm the mixture down between the pots. 5. Keep going until the mixture level equals that of the flower pot rims. 6. Remove one of the pots. 7. Replace it with a plant. 8. Continue until all holes are filled. 9. Top dress with gravel. This prevents the mixture from floating out. 10. Trim off the excess Hessian. 12. Place the basket in the pond. 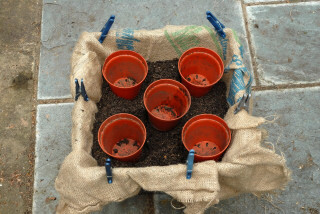 This picture shows the same plants in August after a May planting. 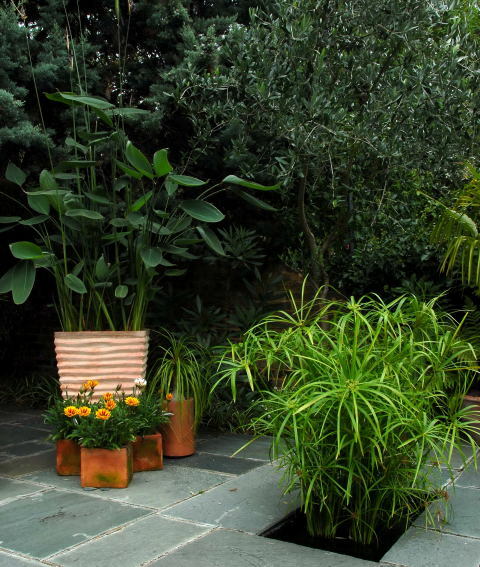 The plant in the tall swamp pot is Thalia dealbata. 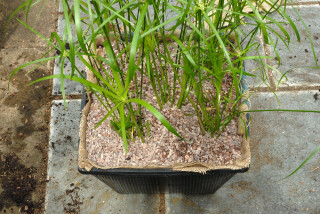 An alternative view of the plants can be seen here: Cyperus alternifolius.